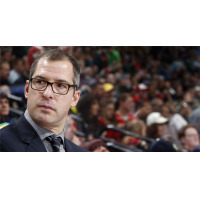 Kamloops, BC - The Kamloops Blazers have announced the full-time addition of Darryl Sydor as an Assistant Coach for the remainder of the 2018-19 regular season and playoffs. "We've been fortunate to have Darryl join our coaching staff on the ice for practices at different times throughout the season and excited that he will now be able join Serge and Dan on a regular basis for the remainder of the season," said General Manager Matt Bardsley. "His playing and coaching experience, along with his familiarity with our team, will be another great resource for our players and coaches as we prepare for the final stretch of the season and the goal of making the 2019 playoffs." Sydor has an extensive playing and coaching background that started with the Kamloops Blazers as a player from 1988-1992. During Sydor's four seasons in Kamloops, he helped the Blazers win the 1990 and 1992 WHL Championship, the 1992 Memorial Cup and was selected in the 1st round, 7th overall in the 1990 NHL Draft by the Los Angeles Kings.